One Direction star Niall Horan has found a musical father figure in the Eagles founder Don Henley. The This Town singer is a lifelong Eagles superfan who has photos of the band all over his home in Los Angeles, and he tells Billboard drummer and singer Henley was a huge inspiration when he realised he was on his own after One Direction announced a hiatus at the end of 2015 and now he speaks to his hero regularly and asks him for career advice. "Don Henley and I talk every couple weeks or so," he tells the publication. "It’s mad. I call him 'Dad'. He calls me 'Son'." And the rock veteran appears to like chatting to the Irish singer, telling Billboard, "Niall is a solid guy whose focus is right where it ought to be: on songwriting. "He’s got the Irish charm and a healthy, self-effacing sense of humor, which is an essential survival tool in this business. I think that Niall will evolve into a resonant, thoughtful voice for his generation." 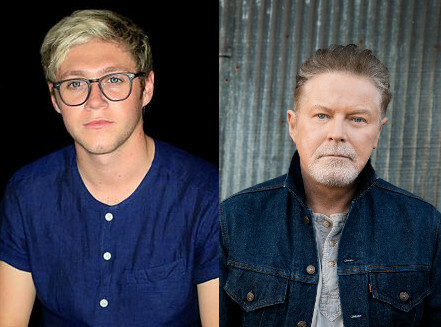 Veteran music producer Don Was agrees after working with Niall on a handful of new tunes which will appear on the pop star's debut solo album. "Niall’s got the stuff," he says. "He drove himself to the studio, carried his own guitar, stepped up to the microphone and was great every take. If they do the Desert Trip festival in 50 years, he’ll be headlining." Desert Trip launched last year and featured Paul McCartney, the Rolling Stones, Neil Young, and The Who. Meanwhile, Niall reveals there's still no timeline for One Direction to end their hiatus and get back to the studio, but he'll be there in a shot when the call comes through. "I told my ­managers from the start, 'When One Direction comes knocking, f**k what I’m doing. I don’t give a s**t if I sold out arenas or won Grammys. I wouldn’t be doing this if it wasn’t for that'," he smiles, adding, "But we haven’t even had a ­conversation about how long we think the break will be."